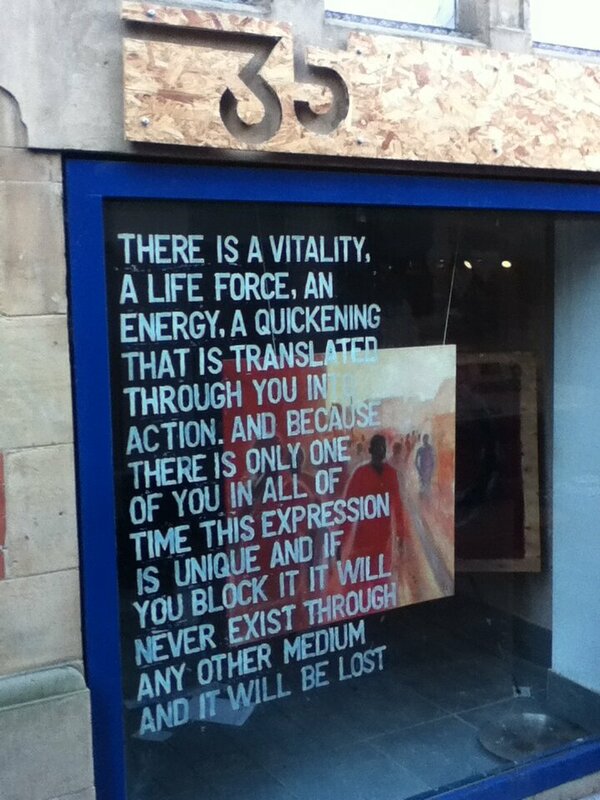 I’ve just finished painting the first part of this quote from the choreographer Martha Graham on the window of the new artspace at 35 Chapel Walk. As I painted on the inside of the glass then people would stop and watch from the other side as if I were an exhibit in a zoo. The process felt like I was offering the words as a blessing for the city. The idea of the ‘queer divine dissatisfaction’ that she identifies resonates with the yearning that I wrote about in the previous post. An awe-full, joyful, overwhelming sadness and longing for something beyond. I can feel it in the process of painting. Each piece of work feels a step along the journey but at the end, after the final brushstroke I step back and want to move onto the next thing, feeling that new doorways and new possibilities have opened up that I am compelled to explore deeper and further. No matter how good or bad the final painting is I always get a sense that there must be more, more to discover, more to create. Here the creative and spiritual journeys are in parallel. There is no arriving only a continual longing to move towards the ineffable that calls us: the ‘queer, divine, dissatisfaction’ that unsettles us from our stupor and prevents us from staying where we are. Graham claims that this unrest is what makes artists more alive than others. I would say that it’s what separates those of us who are alive from those who are simply content to remain at rest in whatever rut the tides of life have washed us into. This isn’t just about artists; it’s about what it means to be fully alive and to be fully human. Anything less is a capitulation to the ever so tempting and ever so comforting glittering, plastic façade of banality.